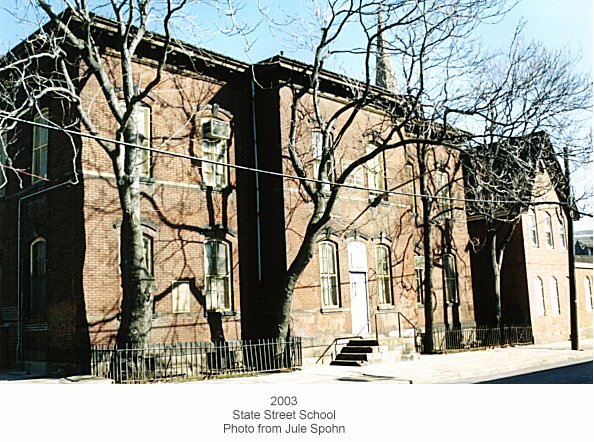 The Public School House in State Street was erected in 1845. The lot is 125 feet on State Street, and 125 feet deep, and was purchased for two thousand and five hundred dollars. The building is of brick, two stories high, with tin roof. This, and the houses in the 2nd, 3rd, 4th, 5th 7th and 13th Wards were built after the same pattern; they are each about 22 feet wide, and, including the vestibule, 75 feet deep. The first story was occupied by the female department, and the second by the male department. Each floor was divided into three rooms - one large room, occupying four-fifths of the floor, where all the pupils of that department assembled in the morning, and remained under the supervision of the principal, except when two classes were sent into the little corner rooms, about 10 x 12 feet, where they recited to the assistant teachers, after which they were sent back to the main room, and others took their places. The Principal heard his own classes and maintained the order of the entire school, of his or her department; there was a principal for each department - one male and one female.